Creation’s Ian Bickerton and Mike Jankowski have had their say on the revised Judd GV5 V10 – fitted to the Creation CA06/H and Henri Pescarolo’s hybrid – while the AERs in the RML MG Lola (the 2 litre turbo) and the two Chamberlain-Synergy Lolas (one 2 litre turbo and one 3.6 V8 turbo) were also clocking up huge distances at Paul Ricard last Sunday and Monday. “Overall, I’m very happy with the V8,” says AER’s Mike Lancaster. “We’ve had some niggly issues, particularly in America, but nothing fundamental – mainly small oversights. Lancaster was extremely pleased with the longevity of the V8 in the Chamberlain-Synergy car (at Estoril and at Paul Ricard), and this Lola’s top speed. 315 kph was the fastest speed recorded on the Mistral Straight by any of the LMP1 cars. The Chamberlain-Synergy LMP2 Lola B05/40 AER was fastest (on lap times) in class, while the RML entry completed that astonishing number of laps on Sunday and Monday. 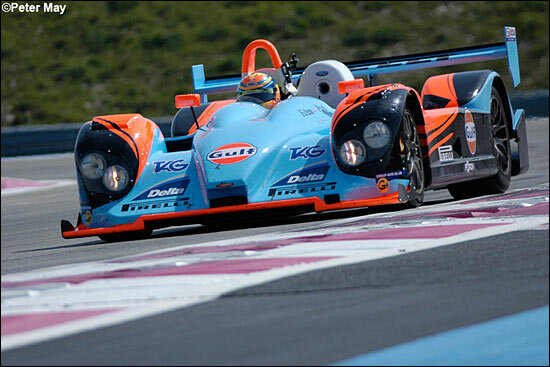 In other engine news, we didn’t discover (at Ricard) that the Belmondo Courages have switched to Mecachrome engines this year. The fastest Belmondo Courage lap time was a 1:50.282, fourth fastest in class, behind the AER, AER and Judd engines in the two Lolas and the new Radical. The French team suffered two engine failures, we believe. The Mecachrome V8s are badged as Ford units (as the team’s AERs were last year) – so without peering under the engine cover (or listening carefully) all seemed as it was (at least at first). Notice that the blue C65s are running on Pirellis this year: the team used Michelins in 2005. In related news, the full Le Mans entry list has been made available, but there is an embargo until March 30. It’s as intriguing as ever!